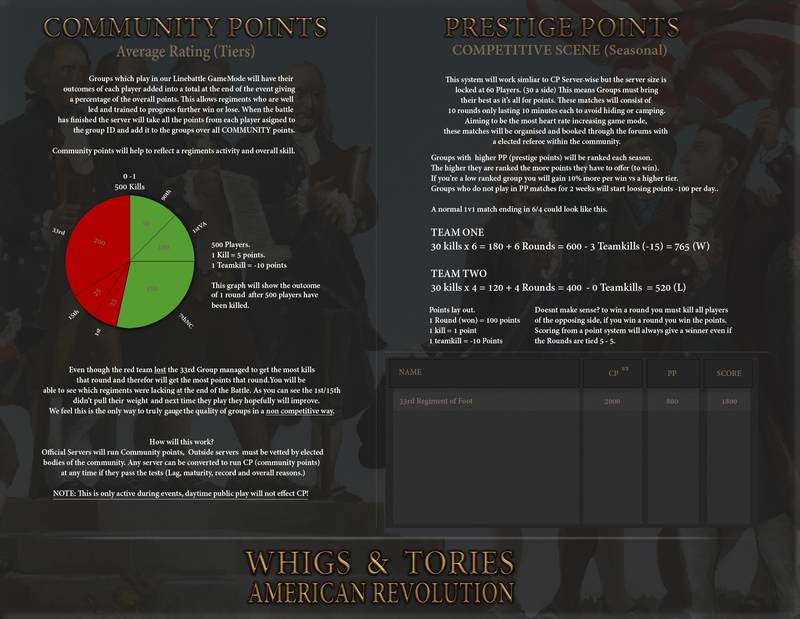 Set in the American Revolution, Whigs & Tories lets you fight in realistic massive multiplayer battles across New England. Whigs & Tories : American Revolution (WaT:AR) is a project created by people who have been enjoying the linebattle genre for many years. We believe linebattle gaming has a lot of potential that hasn't yet been unlocked to its fullest. We've been making WaT unpaid since July 2016 some members working day and night to bring what we believe to be the new standard for Linebattle games from here on out. Offering large scale battles with simultaneous unique players per server, multiple factions, all classes included (Line, Cavalry, Artillery, Musicians), fully fleshed out, a challenging and accurate melee system and many features, WaT:AR will drop you right into the heart of the American Revolution, recreating the feel of how battles must have felt during that time period. We're excited to show you what we can do. Team work full time for a year. Supporting us now will speed up development massively. We have a very strong and dedicated core team but we need extra help. With this funding we expect to have Beta ready by March of 2019. We wish for the final full version to come on steam on November 2019. Streamlining competitive play and giving purpose to generic battles, we feel our system is not only fair but engaging. However not final, this is our concept as to how we want it to work. Player groups, also known as Regiments, are essential to the genre. Therefore, Whigs & Tories is making it easier for leaders to manage their groups. Making a group has become simple, fast and fully integrated within the game itself. Knowing who is in your group and how active they are is now easier than ever. 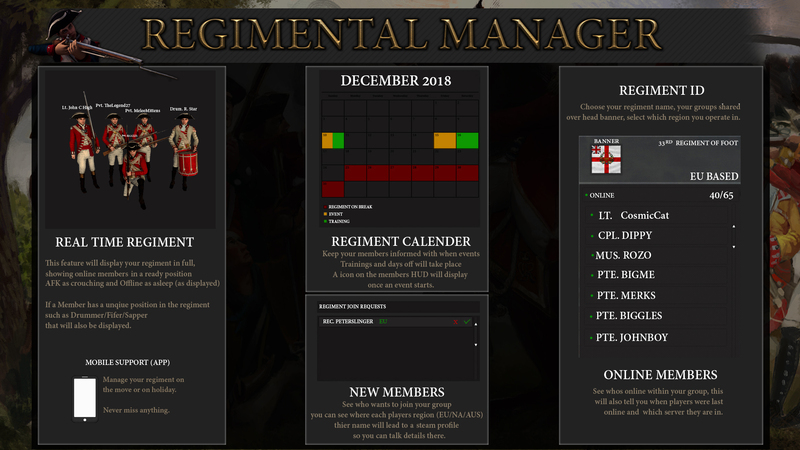 You can also see your regiment grow in real time, each new member will make a difference bringing along their unique character. As a group leader, you need to be able to constantly review and manage your group. We understand this need and we offer the opportunity to do so even if you are away from your computer through our manager tool mobile application. For members, the tool's calendar will make it a lot easier to follow the group's schedule, seeing what is planned for months in advance instead of being spammed to play 10 minutes before a battle. We feel this will benefit mostly new players and busy people. Our project is currently in Alpha stage and it exists on the Steam Store, though it is not available for direct purchase yet. As such, a risk of completely non-delivering doesn't exist as there is already a playable version of the game out there. However, there is the potential of delaying the release in case we fail to reach our funding goals or something else outside of our control happens. You can keep up with the latest things we post! Game Key at release, Donator board access. BETA Access, Game Key, Donator board access. Alpha Access + BETA Access, Game Key, Donator board access. You will be added into Alpha once the kickstarter ends. In-Game Backer Mount on Release. In-Game Eagle Kickstarter Sword on Release. We'll make a regiment for you to be included in the game.